Electric Fences are barriers of electrical energy that appear in the Mario franchise. In Super Mario Strikers and Mario Strikers Charged, Electric Fences appear around all of the soccer fields except for Thunder Island, in which they only appear at the corners. If players get tackled into the fence, they will be shocked temporarily. The fence cannot be seen; it is transparent until players run into it. Some options allow for either Electric Fences to be disabled or it to shock the player if they even go near the fence. Electric Fences appear in Super Mario Galaxy in the Flipswitch Galaxy, Sweet Sweet Galaxy, Battlerock Galaxy, Toy Time Galaxy, Sand Spiral Galaxy, Dreadnought Galaxy and Bubble Blast Galaxy, where they occasionally move horizontally throughout the galaxy and shock Mario and Luigi if contact is made. There are also beams of electricity in Dreadnought Galaxy that act similarly to Electric Fences. If Mario loses a life from an electric fence, he will sometimes turn into a skeleton. 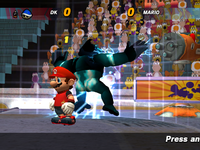 This effect is also seen briefly, if the player looks closely, when Mario takes damage after hitting one. Also worth noting is that no matter which way the camera faces, the reflection on the spheres that make them up shown is always exactly the same. Electric Fences make one appearance in New Super Mario Bros. Wii. They appear in the second airship battle against Bowser Jr.. The player must knock Bowser Jr. into the fence three times in order to win. However, if Mario is pushed into the fence, he will take damage. In Super Mario Galaxy 2, Electric Fences appear in the Flip-Swap Galaxy, Space Storm Galaxy, and Grandmaster Galaxy. They retain their function and effect from the previous game. In the Mario Party 8 minigame Power Trip, an Electric Fence grid is seen underneath the main platform. In Mario Party 9, an Electric Fence surrounds the ring in the minigame Bumper Sparks. In Donkey Kong Country: Tropical Freeze, a single Electric Fence can be found among some pendulums in Precarious Pendulums. This page was last edited on March 7, 2018, at 19:11.